I find it ironic that I have been nominated for the Sunshine Award in the middle of a drought. The Sunshine, usually a welcomed friend to all Canadians, has overstayed his welcome and really needs to share the sky with some clouds. But, I have to admit–a Sunshine Award does sound much happier and upbeat than the Cirrostratus Award. Or the Big Ominous Wall Cloud Award. Plus, I am extremely happy to be nominated for any award, no matter what it is called!! I must thank the awesomely funny blogger who so thoughtfully gave me this nomination–http://palomasharma.wordpress.com/. You HAVE to read her blog. It is hilarious! Her recent The Pakora Chronicles, will make you laugh out loud. Okay. First step has been accomplished lickety-split. Now, on to the hard part. Answering questions about myself. 1. What is my favourite number? I hate Math. Numbers elude me. They taunt me and tell jokes about me behind my back. Therefore, I hate all numbers. Except for phone numbers. They’re okay. And winning lottery ticket numbers are good. But those avoid me completely. I drink a lot of water, but I wouldn’t exactly call it my “favourite.” Don’t get me wrong. I appreciate water. And I know it’s good for me. But if I was on death-row and the warden was offering me my favourite non-alcoholic beverage with my last meal, I wouldn’t opt for water. Not even Perrier. I have to say that I’d be a little pissed that I wasn’t allowed a good stiff vodka–you know, something to take the edge off of my execution. It’s not like it matters if my booze has an negative interaction with my LETHAL injection. And who cares if I get totally wasted and misbehave? 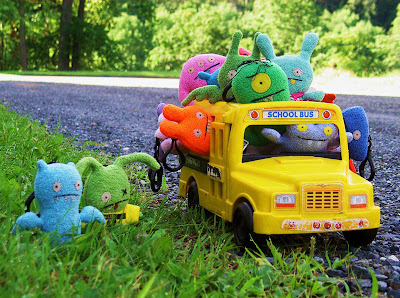 What are they going to do–kill me? But, since I’m still holding out for that last minute call from the Governor to save me (we actually don’t have capital punishment in Canada, but let’s just pretend), I’ll acquiesce and ask for a VIRGIN Strawberry Daiquiri. That’s the best way to go. A beverage that disguises itself as an alcoholic one. And they are so yummy. Seriously. Only one? Hmm…Penguins, Gorillas, or Aardvarks? They’re all good. Oh, I know. My favourite would have to be the Capybara. Who wouldn’t love a giant rodent that can weigh over 100 pounds? I could sic him on the local cats. Revenge for all the eaten chipmunks. I could walk him on a leash. Plus, I think it would be cool to sit on the sofa and watch TV with him. Not a lot of rodents can do that. I prefer to yack to someone in the real world using my actual voice, but if I had to choose it would be Facebook hands down–largely due to my Castleville addiction. I am not sure how to answer this because I am a person who has the attention span of a gnat. It is frightening to think of the number of different “careers” I have embarked on over my lifetime thus far. I either have many passions or I don’t have any at all–I’m not sure which one it is. I guess I’m passionate about trying new things. Don’t get me wrong. There are some things I have no desire to try–taking a bath with a toaster, studying giant insects in the Rainforest, or becoming a test subject for a pharmaceutical company, to name a few. 5. Favourite Day of the Week? Tomorrow. Not specifically “today’s tomorrow.” All tomorrows. The day following today, no matter what day it is now while you are reading this. I’m feeling passionate about specificity right now. Cosmos. True story–when our local Home Depot opened, I went in to the garden department and asked the worker if they had any cosmos. She said they had Woman’s Day and Chatelaine inside. OMG. Seriously. She thought I wanted a copy of Cosmo. Now comes the fun part. I get to nominate 10 awesome bloggers for this award. It’s hard to nominate JUST 10–there are so many awesome blogs out there–but I’ll try. Seriously, it is so hard to just nominate 10! And, again, I’d like to thank http://palomasharma.wordpress.com/!!!! Now I must go and remove the most uncomfortable bra in the world. “Isn’t it a bit unnerving that doctors call what they do “practice””? George Carlin. I woke up feeling “annoyed” today. Not sure why. I got a good night’s sleep–the neighbour’s dog didn’t keep me up howling this time. You’d think I’d be pleased. I even got any extra 30 minutes of shut-eye. But no, I woke up bitchy. I’m trying my best to conceal this fact. Especially because I am usually a nauseatingly cheery sort. Which brings me to another bone of contention. If someone is a grumpy-gut all the time, we simply shrug it off and say, “Oh, that George. He’s such a grouch.” We realize that this is who “George” is and we love him anyway. (Disclaimer: I don’t actually know any Grumpy “Georges.”) But, when a usually pleasant person is having an off day and exhibits even the slightest sliver of bad humour, everyone goes on the attack, questioning said person as to why they are in a bad mood. Isn’t a ray of sunshine allowed a little gloom now and then? (Not that I am calling myself a “ray of sunshine”…other people call me that. And modest too). 1) Let’s face it. People put really ugly things in their front lawns. Things that they would never allow in their living rooms. Hideous little gnomes. Brightly coloured ceramic toadstools (and you already know how I feel about fungi). Crystal balls with their paint peeling off perched on plastic pedestals. It would appear that when it comes to lawn ornaments, tacky is better. This is actually cheering me up. 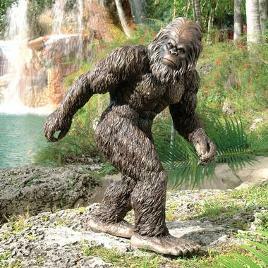 Well, now let me introduce you to the ugliest yard “decoration” ever…the BigFoot Garden Yeti. While there are smaller versions available, it is the life-size model that caught my eye. Although, how you can make a “life-size” version of something that doesn’t exist is quite puzzling. I dare you. Give your gnome a complex. 2) Which brings me to my next topic. Why do we call Big Foot “Big Foot?” (Okay, that was a weird sentence to put into writing). His feet are big, but are they really THAT Big? Consider the Guinness World Record holder for the Biggest Feet–Morocco‘s Brahim Takioullah. He wears a European Size 58, which apparently cannot be found stocked anywhere. A European size 48.5 is the equivalent of a Canadian/US size 14, so one can only imagine what size this dude takes. I once knew a guy who was 6’7″ and he always claimed that his “manliness” was in proportion to his height. Well, if Brahim’s foot size is an indicator of his “manliness,” he will have no shortage of dates. I mean look at those things! They’re huge! 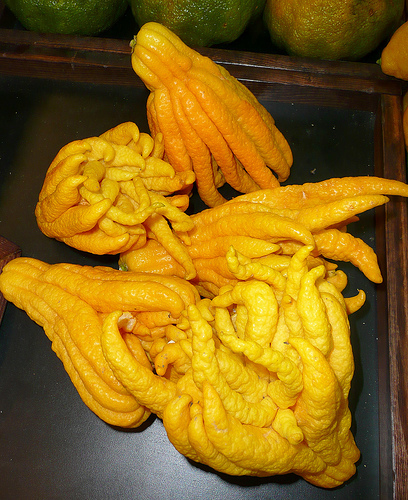 3) Speaking of body parts, welcome to the strangest fruit that I have ever encountered–the Buddha’s Hand (a clever segue, even if I do say so myself). This citrus fruit is kind of creepy looking–like the hands of a Simpsons character that has hung out at Mr. Burns Nuclear Power plant a little too long. Or headless octopuses. (I always thought it was octopi, but this spell-check program claims otherwise). Unlike oranges or grapefruits, this puppy does not require any peeling. You eat the whole thing. One finger at a time. If you have tried one of these, I’d love to hear about your experience. And while you’re at it–octopi or octopuses?